Over the past century, we have been given access to an ever expanding base of self-help literature that we can use to increase our levels of happiness, success, and fulfillment. Since Dale Carnegie published How to Win Friends and Influence People in 1936 and Napoleon Hill published Think and Grow Rich in 1937, thousands of writers, psychologists, scientists, and other self-help leaders have built a wellspring of personal development books that have helped millions of individuals improve the quality of their lives. Recently, the work of Tony Robbins, Steven Covey, Deepak Chopra, and many others has further supplied the self-help industry with new and innovative growth strategies that are built upon both experiential knowledge and scientific research. In today’s world, anytime you look at the New York Times Best Sellers List or browse the local bookstore, you can find modern day self-help classics that offer us the most up to date approaches and tools for improving our lives. 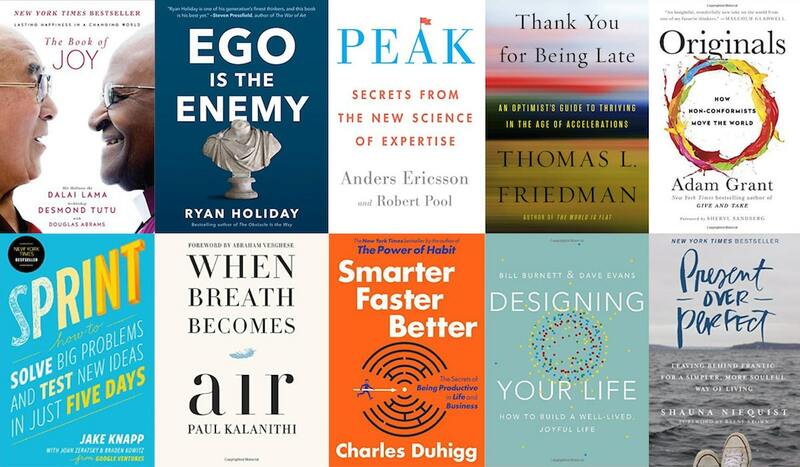 Regardless of if you want to improve your fitness, finances, relationships, brain capabilities, or direction in life, there are new and exciting books that can help induce personal change. In the year 2016, self-help leaders published an abundance of exceptional books that each of us should prioritize reading. With Christmas and New Years fast approach, now is an ideal time to either give the gift of growth or supplement our own personal development as we set our 2017 goals. If you are interested in helping others or yourself become a better person, it would be worth your while to get your hands on what we believe are the top 10 self-help books of 2016. In this New York Times and Wall Street Journal Best Seller, Jake Knapp and two of his partners at Google Ventures, John Zeratsky and Braden Kowitz, show how businesses and entrepreneurs can sprint through the process of turning their ideas into prototypes and decisions in only five days. While working at Google, Knapp created the five-day ‘design sprint‘ which gives organizations and individuals a shortcut to learning without building and launching. In Sprint: How to Solve Big Problems and Test New Ideas in Just Five Days, you will be given one of Google’s most invaluable tools and see how the process has been used by some of America’s most innovative startups. Regardless of your industry, company size, or job title, Sprint can help you turn challenges into opportunities, dreams into reality, and reduce the amount of time it takes from months to mere days. In Thomas L. Friedman’s highly celebrated book Thank You for Being Late: An Optimist’s Guide to Thriving in the Age of Acceleration, the three time Pultzer Prize winning journalist tells us how our rapidly accelerating planet is causing much of our modern day stresses and shows us how we can overcome these stresses by slowing down to reimagine the way we live. This New York Times Best Seller is built on extensive research and illuminates the problems that are arising from the rapid speeds at which technology, the world economy, and nature are accelerating. Friedman tells us that these three planetary forces are transforming five key areas of life: The workplace, politics, geopolitics, ethics, and community. As an antidote to the challenges we face in the 21st century, The award winning journalist prescribes a redesign to these life areas that can only be made possible by slowing down and daring to be late. Andres Ericsson has been dubbed the world’s foremost expert on expertise and in Peak: Secrets from the New Science of Expertise he lays out a revolutionary approach to mastering nearly any skill. In the book, Ericsson, along with co-author Robert Pool, shows how our doubts about becoming an expert are typically unfounded and lays out an innovative path, leading to expert status, that any of us can take. The duo tell us that great human achievement isn’t determined by innate talent but rather consciously focused effort and practice on obtaining the necessary knowledge and skills. This means that regardless of one’s particular occupation or desired goals, each of us can succeed in practically any way that we choice, and Peak offers us the groundbreaking strategies needed to do so. In Present Over Perfect: Leaving Behind Frantic for a Simpler More Soulful Way of Living, best selling author Shanuna Niequist brings readers along on the journey she took to finding true peace and genuine happiness. Like many western world citizens, Niequist previously held the belief that only after achieving great things would she be able to enjoy life. This notion, however, was turnt on its head after she reached a point of complete exhaustion and burnout. Niequist became determined to change her life, and decided that instead of constantly being tired, busy, and isolated, she wanted to live with happiness, meaning, and connection. This is when the celebrated author coined her personal motto, ‘Present of Perfect,’ and began the journey back towards her true authentic self. In this deeply meaningful memoir, which is present as a collection of essays, Niequist shows us how we can live a richer life by trading the unattainable idea of perfectionism in exchange for a new way of living that revolves around simplicity, grace, and love. It was in 2012, when Charles Duhigg would forever change the way the world thinks about human potential in his highly acclaimed book The Power of Habit: Why We Do What We Do in Life and Business. Now, four years later, the decorated author is at it again. In Smarter Faster Better: The Transformative Power of Real Productivity, Duhigg lays out eight key productivity concepts that show why some individuals and businesses are able to accomplish more than the rest. Similar to his 2012 worldwide best seller, Smarter Faster Better has quickly rose the book charts thanks to Duhigg’s meticulous approach to investigative research and consummate storytelling. In Smarter Faster Better, you will learn about some of the most important strategies and tools needed for success and find practical ways to improve your thinking and levels of productivity. In 2014, Adam Grant, a highly decorated Wharton Business School professor, showed us how our willingness to help others largely drives our own individual success in his highly acclaimed book Give and Take: A Revolutionary Approach to Success. Now, the man who has been recognized as one of the world’s 25 most influential management thinkers illuminates the importance of living originally, champion new ideas, and going against the conforming nature of western society. In Originals: How Non-Conformists Move the World, Grant takes us on an exhilarating ride with stories of individuals who have gone against the norm and been being handsomely rewarded for doing so. If you are tired of sitting back and following the status-quo, Originals can help you recognize innovative ideas, understand the perfect time to speak and act, and help you manage your fears and doubts. It was in 2014 when Ryan Holiday burst onto the scene of the personal development and self-help industry with his immensely successful book The Obstacle Is The Way: The Timeless Art of Turning Trial into Triumph. Now, Holiday is inspiring the masses again with what might be his finest piece of work, Ego is the Enemy. In this instant New York Times and Wall Street Journal Best Seller, Holiday uses iconic figures and timeless historical tales to show how our biggest enemy is found within ourselves. At every stage of our lives, Holiday tells us in his intoxicating writing style, the ego hold us back and only by continuously overcoming the challenges posed internally can we reach the highest levels of success, happiness, and fulfillment. Just as Holiday did with The Obstacle is the Way, Ego is the Enemy will inspire you to look yourself in the mirror, strap up your boots, and begin marching towards higher levels of life-satisfaction. There are few religious figures around the globe that hold our admiration and appreciation like either His Holiness the Dalai Lama or Desmond Tutu. In The Book of Joy: Lasting Happiness in a Changing World, we are able to embark on a five day journey with these two spiritual giants, and close friends, as they aim to answer some of life’s most important questions. The stage is set in April of 2015, when Archbishop Tutu traveled to the Dalai Lama’s home in Dharmasala, India, for the revered Buddhist monk’s 80th birthday. During the Archbishop’s stay, and captured in the book, the duo trades stories of heartache and bliss and share the spiritual practices that have made them so beloved. In hopes of answering the question ‘How do we find joy in the fact of life’s inevitable suffering?’ The Dalai Lama and Archbishop Tutu lay out Eight Pillars of Joy that we utilize to find lasting peace, happiness, and bliss. If you are ready to get inspired by two living immortals, The Book of Joy is well worth a read. In this #1 New York Times Best Seller, authors Bill Burnett and Dave Evans outline an innovative approach to building the ideal life. Designing Your Life: How to Build a Well-Lived, Joyful Life is based upon a class the duo teaches at Stanford University and advocates for each of us to examine, plan, and create our lives from the lens of designer. Burnett and Evans, both of whom have a lengthy list of design accomplishments to their name, tell us that we can take the approach that designers use to build airplanes, smart phones, and computers, and use it to construct our ideal lives. Within Design Your Life, the duo presents the central most concept of ‘design thinking’ and show us how we can vastly improve our levels of happiness, success, and fulfillment by applying it to our lives. Regardless of you age, occupation, or situation, this book will certainly open your eyes to a new and empowering way of living. It was in May of 2013 when Dr. Paul Kalanithi received the earth shattering news that he had terminal cancer at only the age of 35. Instead of treating patients who were dying, Kalanithi would have to hangup his stethoscope and begin fighting for his own life. In When Breath Becomes Air, readers go along a heart-wrenching journey as the young doctor searches for answer to life’s most important questions and learns how to deal with his inevitable death. Throughout the book, which has been praised by nearly every major book reviewing outlet, Kalanithi shows us how many of the things we strive for in life really aren’t that important at all. The truth is that in one single moment, as Dr. Kalanithi learned, everything can be taken away from us. For this reason, it’s imperative that we no longer put off what should be most important to us all: living a joyous and happy life. If you are looking to gain a new and life-changing perspective on life, there is no other 2016 self-help book that can match When Breathe Becomes Air. Tools of Titans: The Tactics, Routines, and Habits of Billionaires, Icons, and World-Class Performers: This is the latest book by highly acclaimed author Timothy Ferris (The 4-Hour Workweek and The 4-Hour Body) in which he aims to illuminate the strategies and habits used by the world’s most successful people. Grit: Passion, Perseverance, and the Science of Success Power: In this instant New York Times Bestseller, celebrated psychologist Angela Duckworth tells us that a special blend of passion and perseverance, or grit, is the most important factor of achievement. The Daily Stoic: 366 Meditations on Wisdom, Perseverance, and the Art of Living: This is another 2016 title written by the aforementioned author Ryan Holiday that looks at life-affirming exercises practiced by the great Stoic philosophers. Declutter Your Mind: How to Stop Worrying, Relieve Anxiety, and Eliminate Negative Thinking: In this mindfulness centered book, authors S.J. Scott and Barrie Davenport outline numerous strategies and solutions that can help us slow down our minds. Messy: The Power of Disorder to Transform Our Lives: In this highly acclaimed book, author Tim Harford shows us why messiness isn’t a bad thing and actually lays at the heart of creativity and innovation. Deep Work: Rules for Focused Success in a Distracted World: In Deep Work, author and professor Cal Newport aims to provide us with the tools needed to focus our attention in an increasingly distracting world. Ted Talks: The Official Ted Talks Guide to Public Speaking: If you are interested in learning the public speaking skills of the masters, there isn’t a better option available then this guide from Ted Talks owner Chris J. Anderson. Pre-Susasion: A Revolutionary Way to Influence and Persuade: In this New York Times and Wall Street Journal Best Seller, acclaimed business author Robert Cialdini reveals the secrets of persuasion and making the sale. With 2017 fast approach, now is as good of a time as ever to supplement our personal development with new and innovative strategies that can help us get the most out of life. All of the books listed above offer valuable insight and tools for improving one’s life in a seemingly endless amount of ways. If you think that we missed any titles worth reading (we know that we did), please leave a comment below for other readers to explore the wonders found within the self-help literature if 2016.